Vocelli Pizza franchise business opportunity. 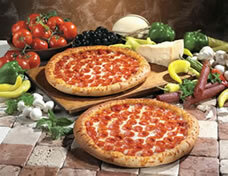 Free Vocelli Pizza business franchise information. Voted #1 Best Pizza in <?xml:namespace prefix = st1 ns = "urn:schemas-microsoft-com:office:smarttags" />Pittsburgh: Vocelli Pizza has been voted #1 in our home market by the readers of Pittsburgh Magazine - 4 Years Running! To learn more about the Vocelli Pizza franchise opportunity, simply complete the form below.